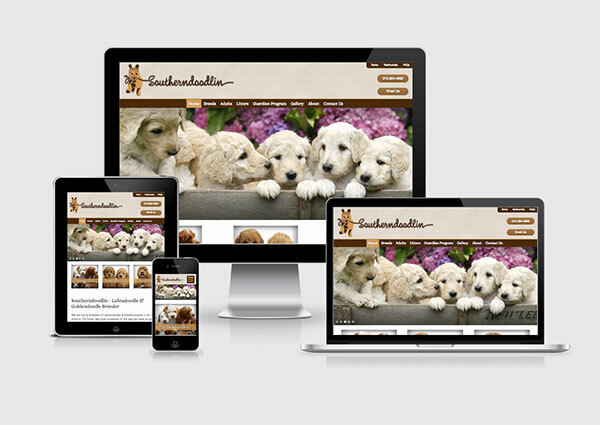 Looking for professional dog breeder web design? 3plains does just that. Our breeder websites are clean, good looking, easy to navigate and search engine friendly so you can drive puppy sales. We have developed special dog breeder management software to manage your puppies, mark reserved and sold and to take deposits online. Set your dog breeding business and website apart. Get a custom and professional web design and crush your competitors. Having a professionally designed website is key in today's marketplace as it directly reflects your website image and your sales. People judge a book by the cover on the Internet... plain and simple. Your job is to make sure your website is not only aesthetically pleasing visually, but also functioning as a professional revenue generator. Your dog breeding business and website needs to be set apart from all the other thousands of sites and the only way to achieve that is to have a custom designed dog breeder website. We can work with you to achieve this high quality professional design. 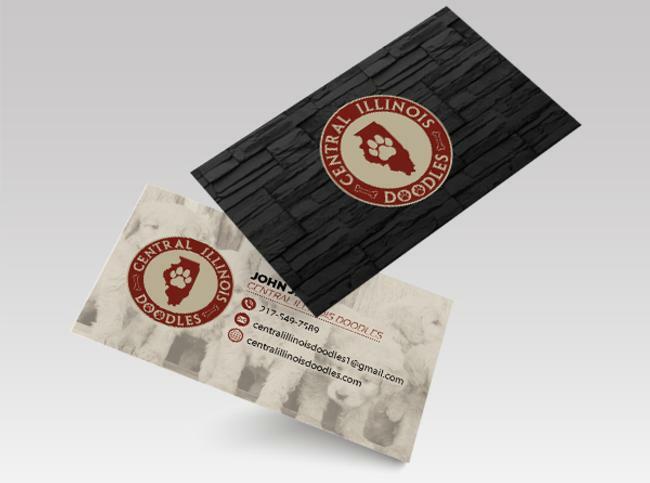 Do you need a professionally designed logo for your dog breeding business? Whatever you need or whatever your idea is for a logo, we can create it. Come up with a crude sketch and we can take your idea and make it happen. In early 2000 it was a lot easier to market your dog breeding business online with the lack of online business competition. With Internet market saturation, new dog breeders in the marketplace, very tough marketing techniques have only heightened the need for a good quality dog breeder website. How will your business and your dog breed standard part from the rest? Your GSP's, Labradors, Golden Doodle's or whatever breed your selling may be some of the best money can buy but how will the average consumer know this? Why will they buy from you? Is is having a website enough these days? In short, no. Just because you have a website doesn't mean it actually can be successful. So as a dog breeder how are people to find you, how are they going to contact you, and finally how will you make the sale? In one word; search engines. Take for example the Minneapolis/St. Paul Twin Cities market. We can dominate the Twin Cities market by city, the state of Minnesota, the region of the Midwest or surrounding states of Wisconsin, Iowa, South Dakota, and North Dakota. How can we do this? We will segment your website to bring the max amount of buyers to buy your puppies for sale. As a dog breeder, this should be what you are looking for. With our custom content management software you are able update puppies for sale, started dogs for sale, add your mature dogs, mothers, sires, litter management and and current dates of updated litters. Our dog breeder content management system makes it easy so you don't have to be an ultra-techy to figure our system out. Our system is very simple to the point. It's great because you don't need to call us to make simple changes anymore you're actually able to manage all the content on your website and we have specialized modules for puppies for sale, started dogs for sale, litter management, updated litters, customer photo gallery as they pick up their pups, blog tools, articles or anything else you feel fit. Example: when you have an expected litter on the way, you will take a photo of the litter, put it on the website, select the mother, select the sire and add a expected date. We can put you site liter information, colors, number of puppies, and puppy deposit information. As the puppies are born, and the eyes open up, you will take photos of the pups, and upload each individual pop to the website of assigning them with a litter. As customers by the pups, you can add information like sold price, sold location, and take a picture with the family and their new purchase. 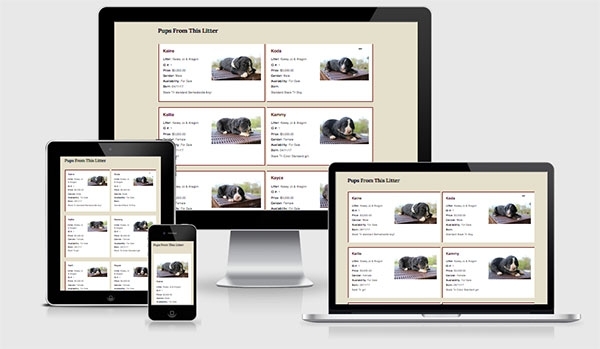 This will add that personalization to your dog breeding website. In addition to these dog breeding website tools, you are also able to add as many pages as want to your website. Match your sharp looking website with your print products, merchandise and logo! Brochures, postcards, business cards, decals, online ad design, traditional ad design and rackcards. View examples below. 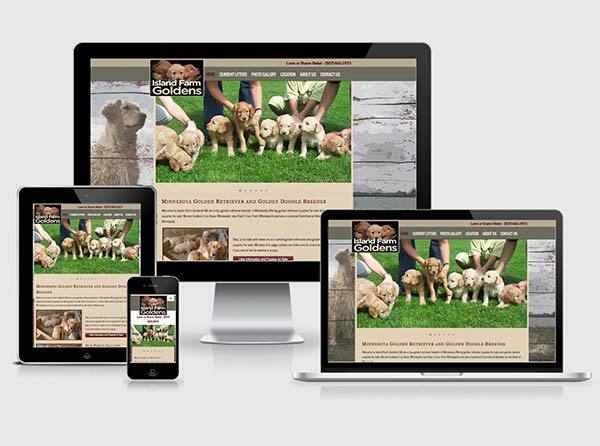 Contact 3plains for your new dog breeder website today. We have websites in a variety of budgets.